The star exploded in a supernova, but somehow it managed to avoid death, and scientists are scratching their heads over its bizarre behavior. A supernova that has been going on for years has mystified scientists, who are hard at work understanding how this zombie star is still living despite its supposed death. Massive stars typically end their lives with a spectacular supernova, among the most energetic phenomena that exist in the entire cosmos. But the supernova iPTF14hls acted strangely, growing dimmer and then brighter over more than two years, say scientists at the Las Cumbres Observatory in California, which has been watching the object. They detailed their findings in the journal Nature. Scientists didn’t pay much attention to it when they first spotted it back in September 2014, as it acted like an ordinary supernova. But a few months later, a student noticed that the object had actually become brighter. 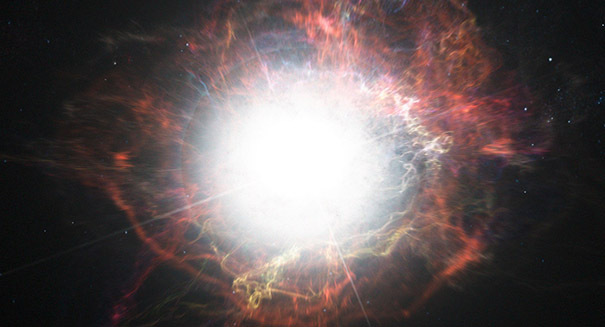 After 100 days, the supernova looked as if it had just exploded, and today, three years later, it is still visible although much dimmer than it was before.